Prometheus, the rebel god, stole fire from heaven and brought it to the human race. This made Zeus, king of the gods, cross, because fire was one of the gods’ secrets, along with lightning and thunder and stuff. 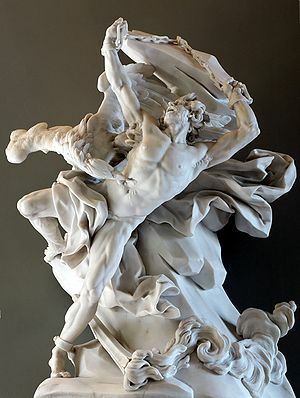 According to some versions of the story, Prometheus thought the gods were being cruel to withhold fire – that could keep those little humans warm, cook their food and keep wild animals from eating them up – so he disobeyed the Olympian injunction. And according to some stories, Prometheus brought more than fire to humans – he taught them writing, mathematics and craft. He paid for his theft, condemned for eternity to be bound to a rock and have his liver plucked daily by Zeus’ own eagle. Every night his liver grew back, of course, because Prometheus was immortal. But, oh the pain and agony. Prometheus was rescued at last by the hero Hercules, who needed his cunning mind to help him steal apples from the Gardens of the Hesperides. Hercules killed the eagle, and thanks to Prometheus’ advice tricked Atlas, who held up the world, into stealing the apples. In astrology, the planet Uranus, the Awakener, is associated with Prometheus – trickster, rebel, inventor. Bradley Manning, sentenced to 35 years today by a military court for selling state secrets, is a Promethean character – a thief of information brought down by the American eagle. He stole millions of documents which spread out across the world like fire. The repercussions of the release of the secret US government communications he gave to Wikileaks are so wide, it’s hard for anyone to really calculate exactly what they are. Was the president of Bulgaria ousted because of the leaks? Did the Iraq War end sooner? Certainly, we can see evidence of a war crime. Were agents lives put in danger by having their covers blown? 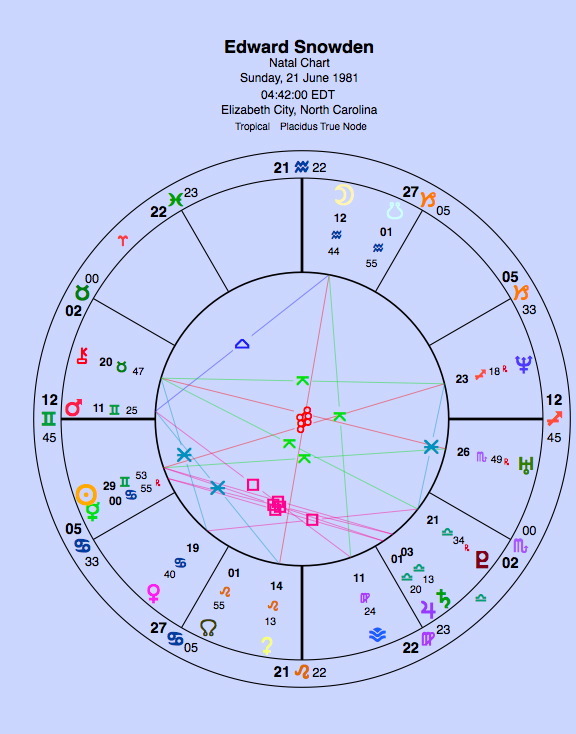 So it’s no surprise to see that Bradley Manning’s chart is dominated by Uranus. There is the awakener, the alien, the rebel, right next to his Sun in Sagittarius, the sign of the broadcaster. How appropriate. Then with the Sun sandwiched between Saturn and Uranus, he has been almost frogmarched to his fate. Bradley Manning must feel like a stranger on planet earth. Not only is his Sun conjunct Uranus, that Uranus is directly aligned with the Galactic Centre. This is not a point I normally use, but in the case of Manning, it’s impossible to ignore. People with the Sun, Moon or Ascendant at this point do seem to have a peculiarity to them, a discomfort on planet Earth almost. I have come across quite a few people with Moon or Ascendant here who truly feel as if they are visitors, almost as though they have been beamed in from another galaxy. What is more, some people feel as if they are in the wrong body. Bradley Manning felt something like that, perhaps, hence the cross-dressing. And he was also, apparently, out of place wherever he went. Bullied in the army, bullied at school in Wales, always a stranger. Chiron opposes that Uranian stellium. His otherness made him a victim. And then there’s the other stellium in Scorpio. We see a little nerdy-looking guy, but underneath that, hidden from us, there’s strength and incredible emotional intensity and passion in that Moon-Pluto-Mars stellium. If he can get through this, he will be able to renew himself, like Prometheus unbound. Remember, we don’t have a birth time, so the Moon is around that spot but the degree is not accurate. Moon-Scorpio: either his mother was a wonderful transforming powerhouse, or she was a nightmare. Mars-Pluto: temper. With the Moon: self-harm. He stole the fire and burned himself. Finally, he has the North Node in Pisces, the sign of sacrifice. It’s interesting to see how Edward Snowden’s chart compares to Bradley Manning’s. Snowden is currently in Russia, running from the American auhorities for letting it be known that the spies are spying. 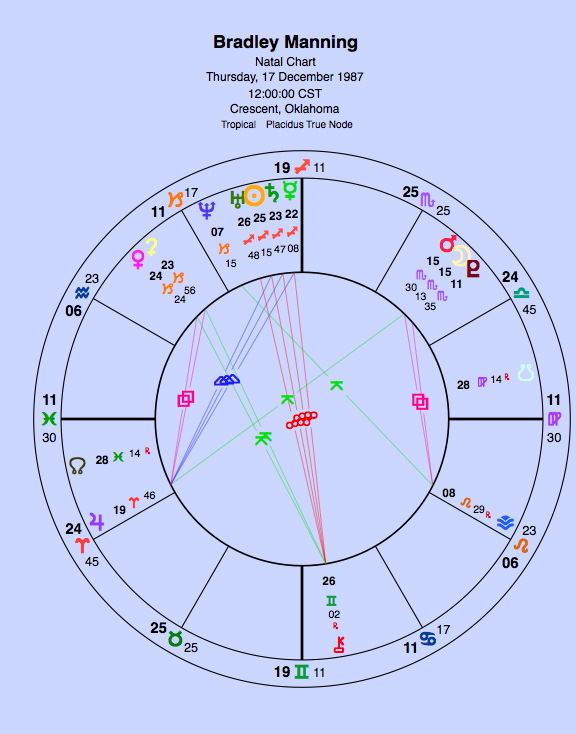 Snowden, unlike Manning, is a computer whizz – see the Aquarius Moon and South Node: technology is easy for him. They’re in the house of broadcasting. Bradley Manning is a mirror for Snowden, whose very late Gemini Sun opposes Manning’s Uranian stellium, and whose Neptune (the mirror) conjuncts that stellium. Consciously or not, Snowden was copying Manning. Manning’s stellium also falls in Snowden’s seventh house – again the reflection of the Self. Snowden has both Ascendant and Sun in Gemini, the mimic. Snowden is finding out who he is. His Leo North Node makes his life-journey a search for identity. One way to find out who you are is to try being other people. With Saturn-Jupiter in Libra the sign of justice, Snowden probably is motivated by a sense of right and wrong, but he is rather rigid with it, and it’s on the cusp of the 5th house of the gamble, the game. It’s just been announced on the news that he has stated his intention to live as a woman and wants to begin hormone therapy. He adds that he has felt he was female since childhood. Not sure how easy this will be for him in prison. And also that NN in Pisces was the first thing that hit me when I looked at this chart – his destiny is to sacrifice himself. Perhaps this will help him cope with the years of confinement ahead. I have the IC conj Vesta on the Galactic Centre. Wherever I live it doesn’t feel like “home”. I’ve always known I will move on at some point, even where I am now at age 64 …. Yes. I hope the hormone therapy works for him, but I suspect it’s may not really be a gender issue. In other words, he’ll get the woman’s body and find that’s equally alien. You were spot on Christina. I wouldn’t be surprised if part of his punishment however will be to deny his desire to change gender. in the Tarot the Fool is associated with Uranus, I guess for Bradley Manning it means he was unable to become conscious of what he was meant to be. He now thinks he wants to be a woman, but Uranus can be very tricky and I would advise him to be very careful, before taking any steps. The fool also means he is at the beginning of a new lifepath and who knows where it will take him. In a few years from now he may think totally different. I feel sorry for him, I think he was tricked by Uranus and now he will have to pay for his (and Uranus’) actions. I would advise him to start studying astrology in prison to become more aware of his situation, now and in the future. I think he needs to understand his position and who knows : in the end the Fool may become the Hermit and a wise man ! With all that Sagittarius in the chart, there is the potential for becoming – eventually – a teacher. I also feel really sorry for him. Looking at his chart, it really seems as though this was much more about his feelings about himself than any grand plan. Yes – at worst it could. As Saturn transits his Moon-Pluto there’s quite a danger of depression and a feeling of total aloneness too. However, Moon-Pluto can also be very resilient and so is Sagittarius. If he can get through the next couple of years, he could rise like Prometheus. The best case scenario is that Manning does the Pluto thing of death and rebirth, gets out in eight years or so and becomes a professor…. I wrote about it at the time. I was working/sailing with a number of young veterans at the time; they gave me the insight into modern US military culture, especially the one who was preyed on for being too decorative and therefore gay. I have lifelong contacts in the US State Department. I was recently out of the internet software industry so I still had an insider look at how Assange was at the time. Hmm, google hates when I comment by phone and spliced that paragraph. Anyway, I wasn’t nice to anybody in my article. Now I’d be a lot gentler, especially knowing what I do about military and civilian prison, from a vet who became a conscientious objector and was in both. Mr. Manning is in for a spectacularly hellish time. And now Google won’t let me sign in 🙂 It’s Isy. Yes – Assange is the trickster in all this. Bradley Manning is a gift- I think the key word for this placement is commitment to truth and justice. May he become a free professor! I have Jupiter on the GC in opposition to Uranus (trine Mercury in Aquarius) and have “visions” of actually projecting from the future like a wave with others who are like bodhisattvas with a commitment to humanity and to all life. Other than that, my life is pretty regular and you can see why this needs to be an anonymous post! One of my GC people – Moon – is also otherwise totally “normal” except she feels she’s been sent here as an alien visitor! Another Anonymous … With NN in Pisces, isn’t his “mission” to merge with everything? And Pisces being such a feminine sign, I would think he might be attracted to that energy, as well as the tendency toward self-sacrifice. I think wherever he is sent — military or federal prison — the overseers ought to be careful to keep him safe or risk creating a martyr. Edward Snowden’s was born in 1983 not 1981! Oh dear. I’ll redraw that chart.